Treatment for a dead tooth is usually either by performing a root canal, or by extracting the tooth. A dead tooth is one which no longer has a living nerve inside it. While you may think that having a dead tooth isn’t a problem, it can actually cause your tooth to become infected, which can lead to various other dental problems. If you suspect you might have a dead tooth, it’s very important to see a dentist as soon as possible. In all honesty, it isn’t always possible to tell why a tooth died, but there are a number of reasons why it could happen and in some cases it’s quite easy to tell what the problem was. The cause of a dead tooth isn’t always the same. Trauma to the tooth (like a knock when you fall to the ground or walk into a wall) can cause the nerve to die, but nerves can also die because of tooth decay. When a cavity in the tooth is formed, bacteria can infect the inside of the tooth and cause the nerves to die. Another common cause is when most of the pressure of your bite is on only one or two teeth, this can lead to a tooth being worn down more than others and can cause the nerve to die in certain cases. Before a tooth dies completely, you might experience a lot of pain, but in many cases patients experience no pain at all, so it isn’t really a good thing to go by. The most common symptom of a dead tooth is discoloration, when blood cells are dying off it causes a tooth to become more yellow or gray. This discoloration won’t go away if the tooth is left untreated. But there are more serious things that could come about as a result of a dead tooth, these include things such as pain caused by an infection present, or the formation of an abscess. Often times patients will lose feeling in the dead tooth completely, but it shouldn’t be assumed that the tooth won’t cause problems in the future if it doesn’t hurt shortly after the nerve has died. No matter how little feeling is still left in a dead tooth, it’s unwise to leave the problem untreated. The tooth cavity will be filled with only dead tissue inside after the nerve dies and this happens to be the perfect place for an infection to develop. If a dead tooth forms an abscess, you might end up with agonizing pain in a tooth that seemed to have no feeling left at all. Treatment is usually done either by performing a root canal, or by extracting the tooth. Depending on your specific case, a dentist can often suggest which one would be preferable. Extraction is usually done in cases where the tooth has decayed too much to be worth saving. But it’s good when an extracted tooth can be replaced with a dental implant, as this replaces missing bone tissue and allows the patient to replace a damaged tooth with a brand new one. 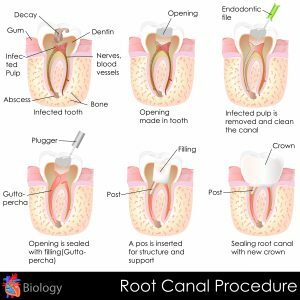 Root canals are done when a tooth seems to be in a good condition. If a tooth is still very healthy besides for the nerve having died, getting rid of it simply wouldn’t make any sense, this is particularly true if a patient is unable to afford replacing a tooth with a dental implant. If you suspect you might have a dead tooth, make an appointment with your dentist as soon as possible. Even if you aren’t completely sure whether or not the tooth is dead, the consequences of leaving a dead tooth untreated could have a serious impact on your dental health. It’s better to see your dentist as soon as possible to avoid any more potential damage to a tooth than to leave it until your dentist is unable to save your tooth altogether.